Blusea Hotel locates besides the My Khe beach, Da Nang city, Vietnam, which is one of the most beautiful beaches in Vietnam. It takes about 2km from the Hotel to the station, the international airport, very convenient for the transaction, work, and travel and shopping. Blusea Hotel has 5 floors with 20 rooms, designed by modern style, reasonable price, adequate facilities (refrigerator, air-conditioner, …). At the Hotel guest can enjoin many facilities such as meeting rooms, mini-bar, internet wifi, special foods and especially, the professional style of serving of the young, dynamic staffs will satisfy you. We believe you will feel safe, warm and comfortable during the time staying at Blusea Hotel. 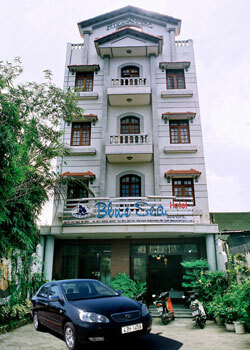 Hotel consist of 20 bedrooms quite luxurious with all modern conveniences and get 2 star international standards.